In Washington D.C. every year the Library of Congress puts on the National Book Festival. The festival started in 2001 under the direction of former first lady Laura Bush. The festival has grown every year and for the past seven years librarians from the New Mexico State Library have represented our great Land of Enchantment. 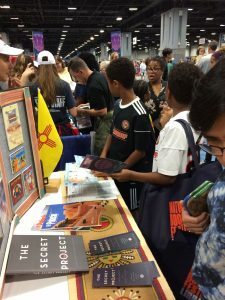 The Parade of States at the National Book Festival is where every state is able to showcase their “Book of the Year” (a children’s or YA book) and talk to people, young and old, about New Mexico’s literature. This year New Mexico’s book was The Secret Project by Jeanette and Jonah Winter. This non-fiction children’s book about the Manhattan Project was very well received and invited visitor’s towards our booth with its title. Many of these visitor’s told us they were from NM and missed the chile and/or loved the library system here in New Mexico. Way to go New Mexico libraries; you are making a lasting and positive impact!! Carla Hayden, the Librarian of Congress, also stopped by our booth and was very complimentary of our display, which featured many of New Mexico’s literary works. Way to go New Mexico libraries; you are making a lasting and positive impact!! As a newbie to the State Library and to the National Book Festival, this was the first time I experienced the amazing onslaught of children and adults who tour through the Parade of States to collect stamps and, hopefully, learn a thing or two about each state. Many of the young people asked about our state flag, which we had displayed. Some asked what our favorite thing about New Mexico is – it is so hard to pin that down to one. One young man even gave me a history lesson about turquoise and told me he thought it was worth traveling to find. I thought it worth mentioning that the National Student Poets were also in attendance at this event. They represent five different regions of the US, including the Southwest. These students visited the state booths from their region and then they performed their work on stage for all to hear. All of these young poets were poised, well spoken, and a great inspiration. The 2018 Southwest Student Poet was from Arizona but who knows maybe next year a young New Mexican will get the gig. The day was long but very rewarding. It is wonderful to see so many people come out for an event centered on literacy. I am so glad I was able to attend this event and I look forward to sharing the great works NM has to offer as long as the National Book Festival is running. 2019 Scholastic Art & Writing Awards – Path to being a National Student Poet! The Great American Read – Vote for your favorite!